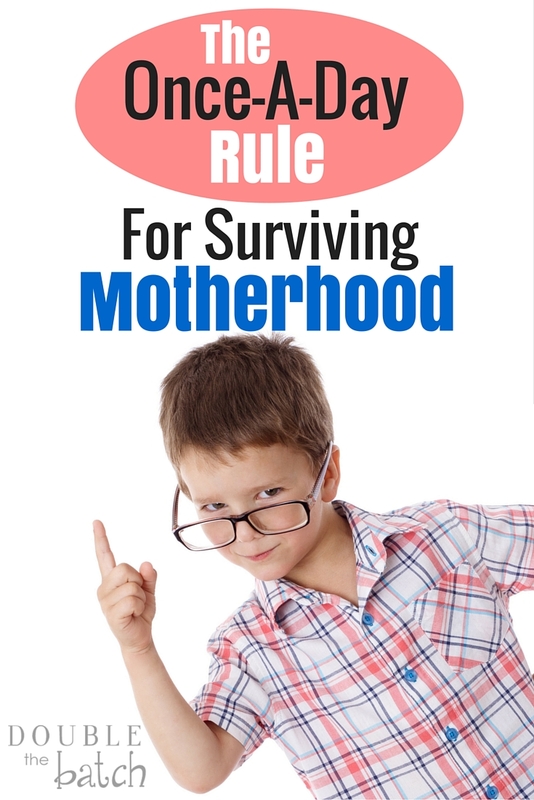 Sometimes motherhood feels like being trapped inside a never-ending whirlwind. Life just keeps spinning and spinning and I can’t seem to keep up and it’s crazy and messy and uncertain and stressful, then someone hits the repeat button and it starts all over again every morning at 6 am. And I just wanna jump out and take a deep breath and access the situation, but it is really hard to get out of a whirlwind, you know? I feel like if I don’t just keep spinning around with everyone and everything, if I don’t hold all the chaos together with my white-knuckled grasp– it will all fall apart… and then what? Well, it got to the point that I decided it was time to take a good hard look at the “then what” option, because, honestly, I was so sick and tired of being stuck in the whirlwind that watching it all fall apart almost sounded appealing. There has to be a better way to do motherhood, I’m thinking. And there is. And I know it. I just like to forget it on a regular basis for some strange reason. There is a simple thing that I can do everyday that slows the spinning down long enough to allow me to center myself and it makes all the difference in the world. 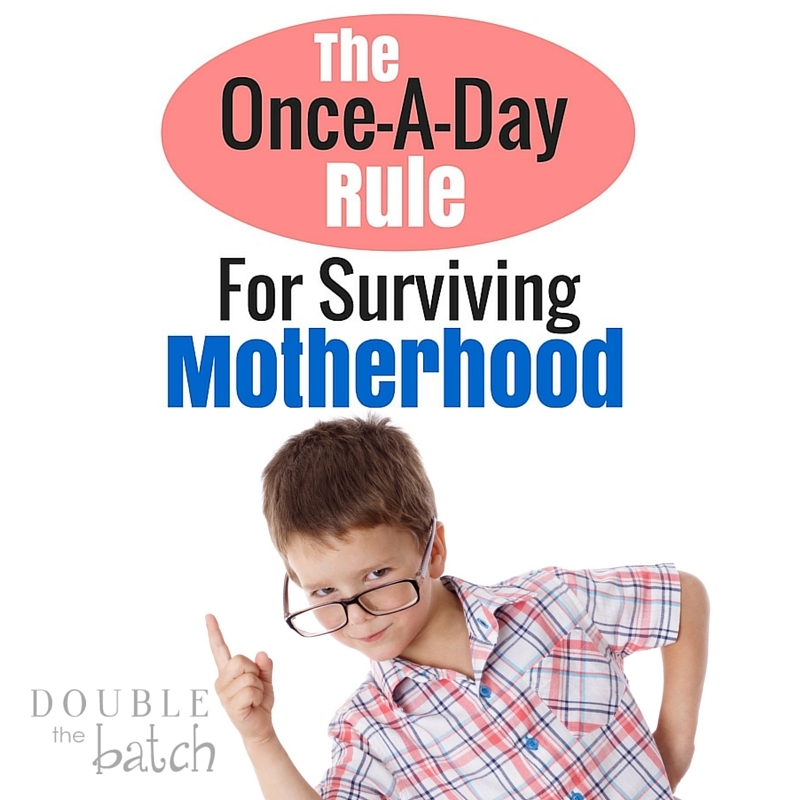 So, let me share with you the once-a-day rule for surviving motherhood while I go ahead and remind myself all about it. While I believe it is true that nothing brings more joy than losing yourself in the service of others, I also believe it is true that you cannot be the mother you want to be if you lose your “you” in “them.” And if there is never any time in my daily life for me center myself and connect with who I am and what I am about, then I just become about whatever is going on at the moment. I don’t operate from an eternal perspective, I operate from here and now perspective, and the choices I make from those two different vantage points are vastly different in most cases. For example, when my kid spills milk all over the brand new couch, if I am operating from an eternal perspective, if I am in tune with who I am as a mother and what I am trying to accomplish from an eternal perspective, I will show more understanding of the fact that this was an accident and my young child is learning and growing and making mistakes along the way. The couch is just a thing and my child is more important than the new couch. I give an appropriate consequence- make it a learning experience and keep my emotions in check. If I am operating from my here and now perspective and I’m dizzy from spinning, my emotions fly out of my mouth and I dole out a harsher punishment than is necessary. I focus more on the importance of the new couch than my child’s worth and feelings. And then I feel awful later and have to apologize, and I lie in bed wishing I was a better mother. So, here’s the thing: I need to fight like a starving person would for the last roll in the basket to give myself that time to center myself each day. Maybe I need to wake up earlier before the little humans are pummeling me with requests… but so far I haven’t been able to pull that one off. Katie wrote a great post I need to re-read about waking up before your kids, though, if you need a little inspiration. Maybe I need to let nap time and “educational programming” time ;-), become my time to escape the whirlwind and center myself. I have been taking these fantastic parenting classes online from Positive Parenting Solutions and the one thing she says makes the biggest difference in our kids’ behavior is consistently spending 20 minutes a day of one-on-one time with them doing something they love to do. They feel connected to us, loved, and important in those 20 minutes and it carries them through the rest of the day. Bad behaviors diminish as their feeling of significance and belonging in their family increases. She goes into greater detail on how we can make sure we are meeting our kid’s needs when it comes to belonging and significance so they don’t act out in negative ways. But that will have to be a subject for another day. I believe the same is true for us as parents. We need to feel belonging and significance. For me, that comes from knowing I am a child of God and my life has purpose. So, to center myself, I need to connect with my Heavenly Father in a meaningful way everyday because He is the one who reminds me who I am and who is helping me become who I want to be. When I don’t do this, after a while, I start to feel disconnected from Him, from myself, even from my children, and I react to life poorly. Instead of feeling belonging, I feel trapped, and instead of seeing what I am doing as significant, I see it as overwhelming and frustrating. Connecting and centering yourself will look different for everyone. For me, it is talking with God, studying and pondering His words, and re-focusing on who I am and what I am trying to accomplish in life. Sometimes it is spending some time developing my talents or working on things I am passionate about. What is it that helps you feel centered and connected to who you are and what you trying to accomplish in life? When I take the time to connect, life doesn’t seem as stressful, I am more patient, loving, and understanding with my kids, I prioritize my time better and there is purpose in my parenting. I go to bed feeling grateful and happy. It is amazing what a difference those 20 minutes can make.